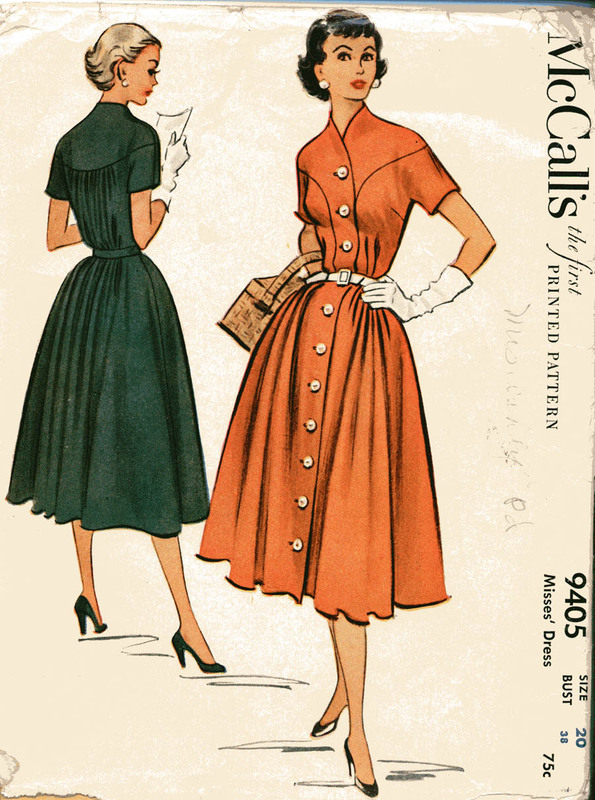 I've stopped buying vintage dresses on Ebay for myself (I'd rather sew dresses from vintage patterns and keep Ebay for feeding my Jack Purcell habit) but don't let me stop you. The only hesitation I feel in recommending this truly lovely dress is this–where would you wear it? It's a day-dress shape, but it's taffeta and chiffon. We don't seem to have that fancy cocktail party dress-up space anymore, or, if we do, everyone is wearing that perfectly serviceable (but just a leeeetle bit boring now, no?) combo of sparkly bare top, low-rise jeans, and heels. Late afternoon summer wedding is the only place I can think of where this would be absolutely the thing. I'm happy to hear other suggestions. If you've been reading this and thinking, "well, that's all very nice, but I don't especially want to look like Doris Day every single day of my life," this post is for you. I've already written and discarded eight paragraphs of argument intended to convince you that you SHOULD want to look like Doris Day every single day of your life, and have instead decided to work from your premise. If you can wear a size 12 or smaller (bust 39"/hips 41"), check out this dress from the French catalog La Redoute. Why should you click on the image, through to the catalog page? Because it's wool-silk (no tatty polyester here), and it's only $39.99! Heck, by now I've almost talked myself into this one. What are you waiting for? 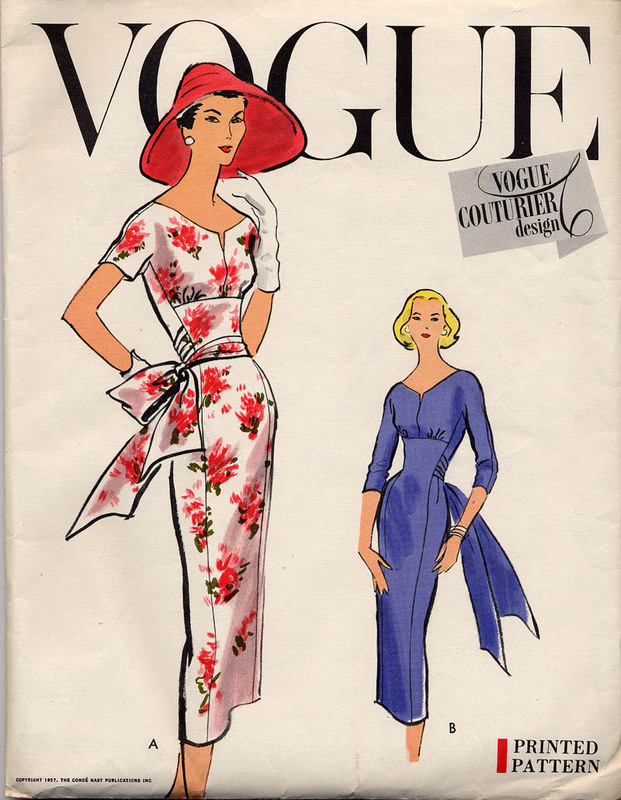 Here's another one from that same issue of Vogue Pattern Magazine. Look at that charming square neckline and the little boxy jacket to throw over it … just perfect. And whoever had this magazine before me thought so, too, as there's a check mark next to this illustration. This issue of Vogue Pattern Magazine is crammed full of amazing dresses, so I'm sure you'll see more of it, and sooner rather than later. Let me just say that 1953? An excellent year for interesting necklines. But for now, turn your attention to the dress on the left in this scan. 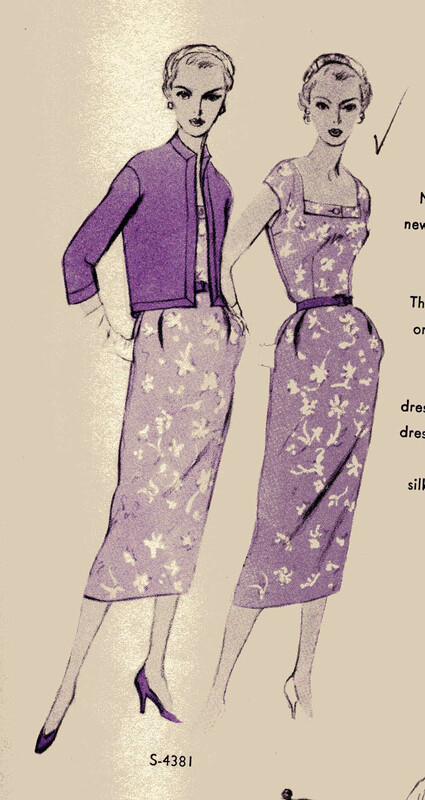 It illustrates perfectly one of the problems of buying old pattern magazines: you are then tormented by being unable to find the actual old patterns. (Pattern magazines, for the most part, are just catalogs of the patterns. They do not contain them.) This is one of the many patterns in this issue that I've been looking for for years. 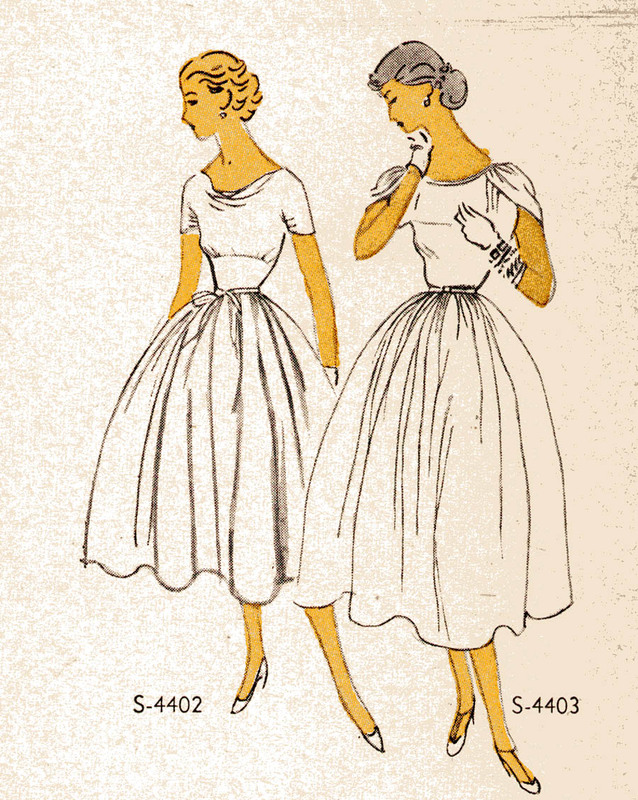 The drape at the neckline, the full skirt, the soft gathering under the bust: if I had this pattern I would have made it several times over (pale-blue handkerchief linen, anyone?). But I don't, and I'm too lazy to draft my own pattern for it, so this dress stays on the page instead of hanging in my closet. Sometimes it's not so much the look of the dress (although this one looks, in my opinion, marvelous) but the feel of it. Look at that gathering at the bottom of the back yoke. Made in a heavy enough fabric, this would pull your shoulders back, make you stand straighter. The gathering at the center back of the skirt, so much more than at the front, would feel like a train. How do you feel, if you are standing with your shoulders well back, and if when you move you it seems like you are managing a train? You feel like a queen. I may yet dig it out and finish it up, though, because the lines are gorgeous. You know the person who designed that went home pleased with herself that day. Anne surveyed herself in the mirror of the blue room with girlish satisfaction. She had a particularly pretty gown on. Originally it had been only a simple little slip of cream silk with a chiffon overdress. But Phil had insisted on taking it home with her in the Christmas holidays and embroidering tiny rosebuds all over the chiffon. Phil's fingers were deft, and the result was a dress which was the envy of every Redmond girl. Even Allie Boone, whose frocks came from Paris, was wont to look with longing eyes on that rosebud concoction as Anne trailed up the main staircase at Redmond in it. from Anne of the Island, L.M. Montgomery, 1915. Submissions for this recurring feature of A Dress A Day are gratefully accepted.